Istanbul International Airport Open Again After Attack Kills At Least 42 : The Two-Way More than 230 people were injured on Tuesday in an attack by three suicide bombers, Turkish authorities say. Less than a day later, flights have resumed at Europe's third-busiest airport. 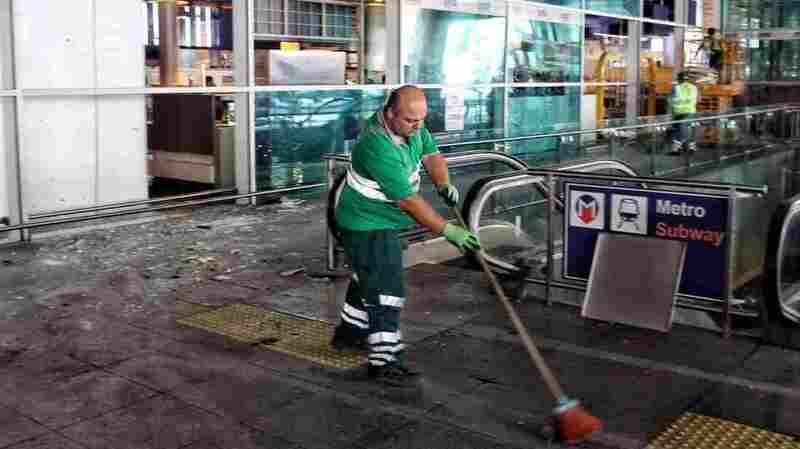 Workers clean the debris from yesterday's blasts at Ataturk Airport in Istanbul on Wednesday. At least 42 people died in Tuesday's attack on Ataturk international airport in Istanbul and at least 239 people were injured. At least 13 foreigners or dual citizens are among the dead, the Turkish government says. The attack was carried out by three suicide bombers armed with guns and explosives, according to authorities. No group has claimed responsibility for the violence, but Turkish Prime Minister Binali Yildirim says he suspects the Islamic State was behind it. Ataturk is Europe's third-busiest airport and a major international transit hub. The airport has reopened for business, and debris was rapidly being tidied up. NPR's Leila Fadel, whose plane arrived at Ataturk on Wednesday morning, described "workers cleaning up damage, passengers whizzing by shattered windows." "It's a bit of a strange sensation, to watch people rolling their bags around, shopping at the duty-free, and also seeing the remnants of damage and a very recent wound here," she said on Morning Edition. "Definitely a sign that the Turkish government wants to pick up and keep going and tell people to continue to come here." 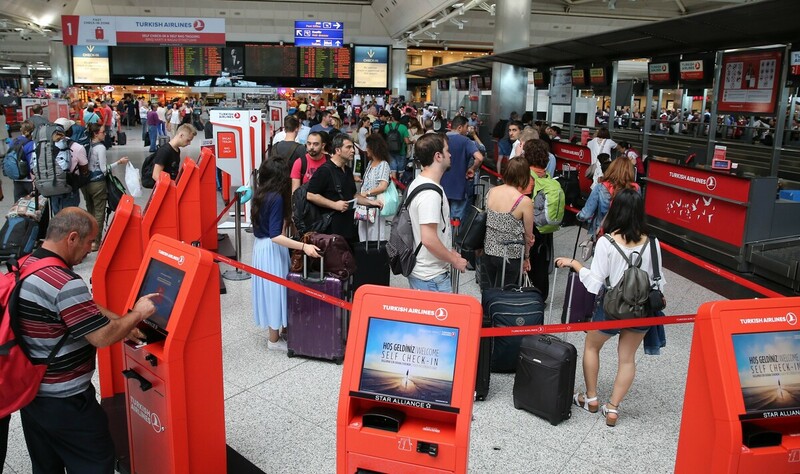 On Wednesday, passengers line up for flights as usual at Turkey's Ataturk airport. "The justice minister said the assailants got to the airport in a yellow cab and opened fire at the entrance security checkpoint before detonating their bombs," she reports. "The attackers targeted international arrivals gates." There are conflicting reports about how exactly the attack played out, Leila reports, but Turkey's prime minister says the three suicide bombers opened fire before setting off bombs. There were reportedly two bombs inside the arrivals hall, and one in the parking lot of the airport, Leila says. Judy Favish, who is from South Africa and had a two-day layover in Istanbul, was at the airport when the attacks began. She spoke to Morning Edition about what she saw — or rather, in the first moments, what she heard. After the sounds of gunfire and a "very big bang," Favish says, "all I could think of was to run and hide." "Walking out of the building, it was just horrible, because there was blood everywhere," she says. "But I am very lucky. I only lost a suitcase." NPR's Dina Temple-Raston, citing two officials briefed on the attack and investigation, says that authorities have interviewed the taxi driver who dropped the gunmen off at the airport. He has now been released, Dina says. NPR's Peter Kenyon, who is based in Istanbul but is currently in London, says the Ataturk international airport has strict security protocols — measures that are significantly more stringent than those at the Brussels airport that was attacked in March. "Ataturk airport [has] two layers of security — unlike Brussels, they have a screening and check passengers at the terminal entrance before you get in, and then after you check in there's another one before you get to the gates. So anybody transiting through Ataturk airport would be behind two security barriers and pretty far away from where this attack took place — but that's no consolation if you're one of these dozens of families with victims now. "And the question is, where do you put the barrier? Because that becomes the target. At Tel Aviv, for instance, you get checked well before their terminal; in Baghdad, the checkpoints start miles before you get there. "And it's a big problem: How do you make travelers more secure without making air travel even more frustrating than it already is? The answer seems to be more intelligence, stop the attacks — and that, of course, as we've seen, is also extremely hard." "In an unusual occurrence, footage of the attack is being shared on Twitter, in several videos that rely on smartphone video taken of the airport's security camera monitors. "One such video, seemingly taken from the camera above the check-in desk, shows people running from the area of the explosion. While the video doesn't include graphic images of personal injury, we'll warn you that it does depict a traumatic event at around the 17-second mark, as the blast generates a powerful fireball." "Another video posted to Twitter suggests security personnel shot an armed attacker as he ran around a corner in the airport. That video shows people fleeing from a man who then falls to the ground. The man struggles on the ground for some 20 seconds before the scene is overtaken by a large explosion." The U.S. Embassy, which is working to ascertain whether any Americans are among the victims of the attack, has posted a page to help travelers. The U.S. State Department had issued a travel warning for Turkey just a day before the attack. White House Press Secretary Josh Earnest says President Obama has called Turkish President Recep Tayyip Erdogan to "express his deep condolences" and offer U.S. support for the investigation. Turkey has been struck by a series of deadly attacks this year — including attacks in Istanbul in January and February, attacks in both Istanbul and Ankara in March, and an attack targeting police in Istanbul earlier this month. Some of those attacks have been claimed by Kurdish militants; others have been attributed to the Islamic State. It's very unusual for Istanbul to see four deadly attacks in six months, Mortada reports. "This is not something that happens very often in Istanbul," she said on All Things Considered. "This year has been very, very violent for this city."